Phong Nha - Ke Bang National Park contains a complex karst area dating from the Palaeozoic era, which makes it the oldest in Asia. The site has high geodiversity and many geomorphic features such as underground rivers, dry caves and sub-aerial stromatolites. This makes it of very great importance for increasing the understanding of the geologic, geomorphic and geo-chronological history of the region. The site consists of two parts: Phong Nha Nature Reserve and Ke Bang forest. 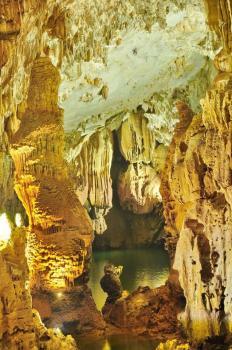 The area is noted for its Phong Nha and Vom cave systems. They are composed of 300 caves and grottos with a total length of about 126 km, of which only partly have been surveyed. The cave system has one of the world's longest underground rivers. Some 92% of the park is covered by tropical forest, 92.2% of which is primary forest. Ah, this really is a find! And then to realize that I had thought of skipping it – another cave, and a bit out of the way. Directions in the Lonely Planet are made more difficult than they really are however: Phong Nha is an easy day trip from Hué. Several days a week there are tours organized by the travellers cafés. I wanted to go on another day, so I rented a car + driver for myself. It takes about 3.5 hours to get there, most of it via a shiny and quiet asphalt road that crosses sections of the Ho Chi Minh Trail. Traces of the Vietnam War are also clearly visible at the entrance of the Phong Nha cave: crater holes that have turned into small ponds. From above you’ll notice that the landscape is dotted with them. 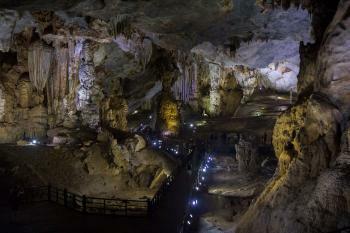 The Phong Nha cave was used as an important Northern base during the war. A trip into the cave is all organized from the town of Son Trach. At the ticket office you have to pay the entrance fee to the caves (Phong Nha and the adjoining Tien Son), and pay for the boat. As I was on my own and there weren’t many other people around to share with, I had my own boat. A couple speaking only Vietnamese manned this small wooden ship. They used the motor getting from Song Trach to the entrance of the cave (about 20 minutes). The characteristic karst landscape already is pretty spectacular here: think of Ha Long Bay without the bay, or Yangshuo along the Li River. A couple speaking only Vietnamese manned this small wooden ship. They used the motor getting from Song Trach to the entrance of the cave (about 20 minutes). The characteristic karst landscape already is pretty spectacular here: think of Ha Long Bay without the bay, or Yangshuo along the Li River. The motor is turned off when entering the cave. They then paddle on – a surreal experience, so quiet, dark. The underground boat trip finishes at a large series of caves, where you step onto a beach. Then you have to walk out of it (the boat carries on to a pier outside, I thought I had gathered this from my Vietnamese speaking boat man, but I checked with some Vietnamese tourists to make sure). Outside awaits a very long flight of stairs that takes you to Tien Son cave. You have to pay for it separately at Son Trach, but there was nobody around to check the ticket. Actually, I was the only one in the cave. It was a bit scary to be honest – it is a large cave, typical dripping stone, quite wet and slippery. I was thinking what would happen if I would fall out there and break my ankle. Would some official at the end of the do a final round of the cave to see if nobody/nothing was left behind before closing up? Or would they just ask the gossiping sales ladies at the entrance if someone was still there (and they obviously would not have paid attention or could not care less). Fortunately I came out unharmed, and took my boat back to Son Trach. The total experience at the caves and the river took over 3 hours. For me personally it was a much more rewarding experience than Ha Long Bay - the boats are smaller, it's more quiet, you get a more close-up experience. I regret taking a tour for this. You pick one of the activities and spend most of the day on a bus from Hue and back on the same day, and Hue being a WHS makes this an easy follow-up but what I really recommend is staying in the park for 1 or 2 nights and do more than one activity. Don't just "tick" this one off for the sake of completing a list. I chose the Paradise Cave because it was recommend to be the most beautiful one. It is a big cave and rather impressive for someone who has seen even a few around the world, but was it worth coming all the way for? I ended up chatting with the people on the tour most of the time and we all felt the cave was okay but the guide did not even explain anything to us. There are other caves to explore, zip lining might not be your thing, nor is mud cave exploring (i.e. a bath! ), boat trips, and then there is still the forest which is inside the ancient karst region. Having just spent a few minutes at the tourist information booth where some people were dropped off to stay at a local accommodation, I knew there is a lot more to do here instantly. As a regular tourist, you can only walk through the first kilometre and a half of Paradise Cave, although there are special tours that can take you further. This first section is designed for visitors, with a wooden pathway the whole way and tasteful lighting illuminating the special features along the way. When it comes to these features, there are so many to see. The start of the cave is an enormous cavern, bigger than a stadium, but when you get a bit further in it’s the stalactites, the stalagmites, and the limestone columns that dominate the view. They come in all different shapes and sizes – thin ones and thick ones, smooth ones and jagged ones. Some look like rows of guardians, watching over their theatre. Another looks like a house. Another like a waterfall, in suspended animation for millions of years. 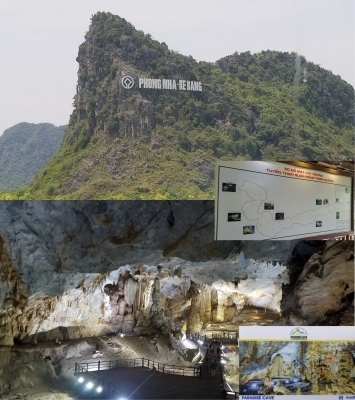 I decided to visit Phong Nha – Ke Bang National Park after the hotel receptionist in Hue confirmed to me that the one day trip to visit the cave is very easy and enough to see all interesting places. In the next morning, a minivan pick me up from my hotel at 6.30 and after many brief stops to collect more passengers from other hotels, the minivan were fully packed with both local and foreign tourists. I learnt that most of the passengers were not part of a tour group but just used minivan to Phong Nha town. The guide also informed me that I have to choose between Phong Nha Cave and Paradise Cave, the two caves that are accessible for normal tourists, as there was no time to see both caves. Most of members of the tour group immediately chose Paradise Cave for more adventurous experience offered, only a few including me chose Phong Nha Cave for relax river cruise tour. The minivan made two brief stops at the ruin of Our Lady of La Vang church where the Marian Apparition has been reported in 1798, and the Vauban styled Quang Tri Citadel where the Battles of Quang Tri during Vietnam War happened. At noon the minivan reached the city of Phong Nha, the Karst landscape around the town is quite beautiful, after many stops in town to send passenger, we finally arrive at the Phong Nha cave tourist center to have lunch. After lunch, the Paradise Cave group left earlier by the same minivan to another park entrance, and the rest including me walked leisurely to nearby pier for the boat tour. On the boat we joined with a group of Vietnamese tourists, very fortunate as their English are very good and they helped us to translate what the boatwomen said. The view along the river is very lovely with beautiful mountain, small villages, a catholic church on the hill, playing and swimming kids in the river, cool breeze; perfect time to relax after long ride in small minivan. The boat stopped for a while at the beach next to the cave entrance to open the boat roof - simple design but great idea! Inside the cave, the boatwomen took me to see many normal appearances of Krastic caves, stalactites and stalagmites. They are nice to see but nothing really unique or special but at least I think this cave is much better than the new 7 wonders cave in Palawan, Philippines. The general shape of cave is triangular which is quite different from other subterranean river caves I have seen. The boat moored on the beach inside the cave and we walked back to the entrance. Along the way has some of the best dripstones of the cave, including sadly former travertine that dried up and has been used as steps to the exit. Outside the exit has a small uninteresting temple and small shops selling refreshments. I waited at the beach until the boatwomen called me to go back to tourist center. The total experience in Phong Nha Cave was around 2 hours, quite OK for me to see just one cave. I waited at the tourist center for minivan to Hue, after 30 minutes, the old minivan arrived with the group of tourists from Paradise Cave. The minivan was really dusty and the passengers looked really tried and one even injured, later the guide told me that the yesterday rain made the pathway to the cave muddy and slippery, very contrast to my group. Then the minivan picked up more people in Phong Nha town and sending them in many towns along the road to Hue. Since the driver used the different main road from the morning in order to send passenger, the traffic were really bad, from 4 hours in the morning turned out to be almost 6 hours in the evening. There was no time to stop for dinner, and only one stop for toilet! At least the guide gave me a box of snack and I personally brought two bottles of water from my hotel, which tremendously saved me from the hellish long drive. I finally arrived at my hotel in Hue almost 9 PM at the time that I already lost any appetize or willingness to have dinner! Except the return trip, the tour is quite fine, but I would not recommend to do it except really lack of time. For its World Heritage Site value, for me it is too early to decide since Phong Nha cave is just a small tip of iceberg of the vast system of newly discovered gigantic caves in the national park including the famous Soon Dong Cave, the biggest cave in the world at this moment. The area still keep many secret and when those giant caves open to casual visitors without expensive tour organized, then I may come back again to see its real greatness. My cousin and I were at the Phong Nha Cave in February of 2009. Our visit was doeable via the bus that originates from Hanoi. When we stopped at Dong Hoi we took rides on the back of 2 motorcyclists who drove us there in the open air. The ride was close to an hour and goes through some amazing rice patties and tree farms. The road is new and very comfortable to ride on. There is very little traffic as Central Vietnam is still a fairly lowly populated area compared to the North and the South. Arriving there, we were amazed by the beauty of this park. For some reason, one could still see many farms on the lowlands inside this protected national park, but as one look upward towards the karst mountains all you see is picturesque beauty that is very green and comforting. The canoes that took us from the park main entrance to the embankment inside the park wiggles through some amazingly emerald waters so that in some parts of this river one could see the bottom with the naked eye. There were two caves that we have visited: one on top of this hill that we climbed after numerous steps and rehydration with local vendors who sells these products and another cave which could be reached through a river which runs inside it. The cave reached via the river is pretty radical considering that there is no light inside this tunnel and only a few people are in front of and back of you. The formations of this cave is plentiful and amazingly grand. Phong Nha is part of unique set of cave systems in the world in that it has a subterranean river flowing through the cave and out and the river is navigable by boat. This allows the visitor a unique experience to sit in a boat and either paddle or cruise through the cave while admiring the experience. My family and I experienced Phong Nha in 2005. The starting point is the town of Dong Hoi which is access able from Hanoi or Ho Chi Minh. A short drive brings you to Phong Nha which is a pleasant place to walk among the mountains. 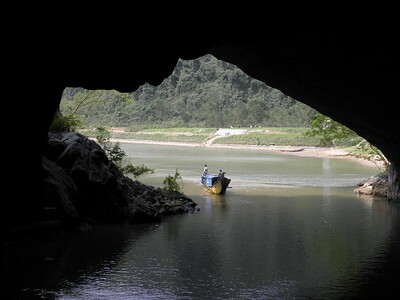 The cave is located on the river and boats can be rented to paddle you in. The cave is about 5 miles deep but the boat will take you less than a mile and then you get to walk in dry caves looking at the rock formations. I have experienced several other similar caves, notably the Yellow Dragon Cave at Wulingyuan, China (WHS) and the Puerto Princesa Cave on Palawan, Phillipines (WHS). Phong Nha is by far the best and most natural with the most unique rock formations. The Yellow Dragon Cave has become very touristy and feels like Disneyland and the Puerto Princesa Cave in the Phillipines are a big disappointment. The trip to Puerto Princesa is long and bumpy together with a rough boat ride across the bay. The karst formation on the cliffs look beautiful but when they motor you in the cave, there was nothing to see. You paddle in and after 30 mins, you turn around and paddle out.